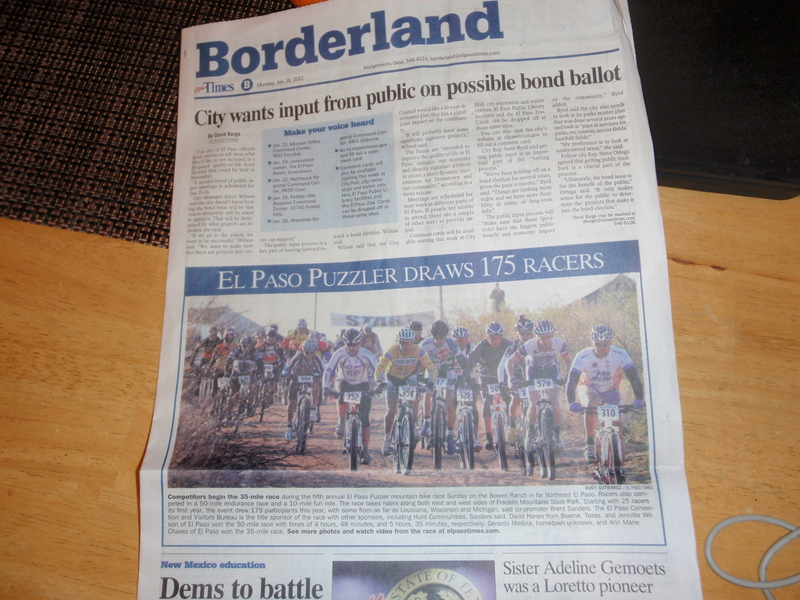 You are currently browsing the category archive for the ‘borderland mountain bike association’ category. I’ve never liked the standard McLeod tool for trail work. My main complaint has been the 48″ handle. At 6’5″, that’s w ay too short and it caused me to have all kinds of soreness in my lower back. Hell, it pained me to watch average height people use it. The benefits of the McLeod’s head are outstanding. It’s wide enough enough to use the corners as a significant lever when trying to pry rocks out of the ground. The tines work great at sifting the rocks from the dirt, but they can break off if you aren’t careful. For years I’ve used a ZAC Tools McLeod. It came with a fiberglass handle with a wooden insert. It was tough, but way too effing short. 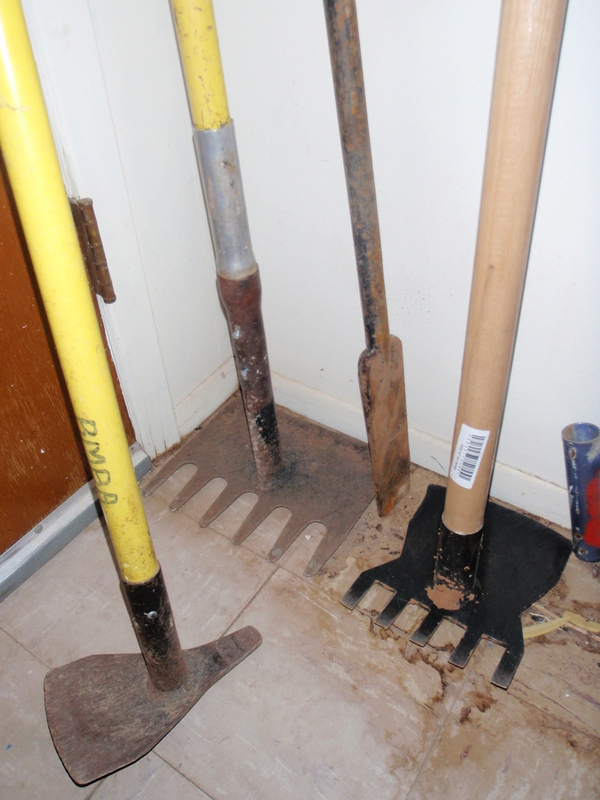 A couple of years ago our club purchased some 60″ fiberglass handled Rogue Hoes. We called them the Sarah Palin tool. The long handle was fantastic, but the head was too small to be effective. 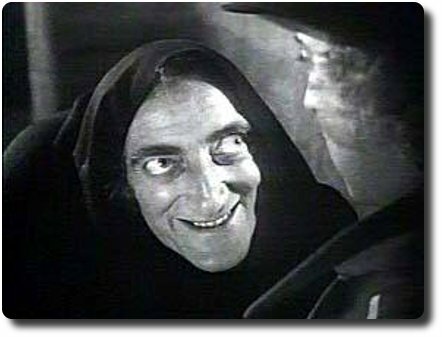 Women liked using them because they didn’t hang up in the rocks and roots as easily as the McLeod and the longer handle kept them from having to hunch over like Igor. I got sick of my short handle, yanked it out, yanked out the 60″ handle on one of the Rogue Hoes, and installed it on my McLeod’s head. Now I have a 62″ long handle on my McLeod head! I epoxied the thing in there since I could only insert it deep enough to get the first bolt through it. The aluminum sleeve on it really stiffens it up so you can yard the crap out of the thing when trying to unpluck stubborn rocks from the trail. For years I’ve always wanted Rogue to make a longer handled tool with a McLeod like head. I checked their website the other day and low and behold, they are now making a 54″ McLeod like tool. It looked so cool, so I used some club funds to buy 2 with the intention of giving one to trail building guru Robert Newman. He’s kind of picky, and he loved it! I still prefer my custom McLeod, but a few minutes with the new Rogue McLeod, and I’m wishing they made a 60″ version. It’s head is super thick and the blades are sharp. It’s the perfect size. The BMBA is hosting a poker ride on the 17th of May. I’ll have more details next week. Our regular club ride is this Sunday at Heinrich. 8 am….new time to beat the heat. This Saturday I’m doing a slaughter fest in the Franklins with 3 trips up to Mundy’s Gap in the plan. Start at Heinrich, bee line up to Mundy’s, clockwise around big loop in park on west side, back up Mundy’s, down the middle road (past the tires) to Mad Cow, back on Sotol, Scenic Rd back up to Mundy’s, turn around and head back to Heinrich via Stan’s and whatever else I feel like riding. I’ll be caching some water on Scenic. Hopefully hit Heinrich by 8:30 am. Let me know if you want to join me for some or a all. Jen’s going to try to hang on as long as possible. I’ll be rolling gears and big tires. The last two weeks have been CRAZY! The IMBA crew came to town….with pretty short notice in my book. But no biggie. We adapted and the members that came out learned some new tricks. We also learned that we should slow down a bit on our building and work harder to build trail better. 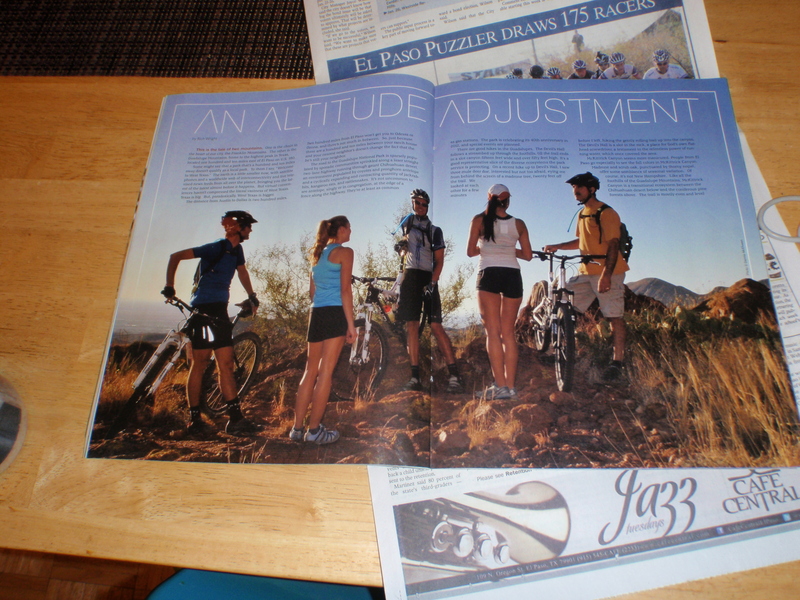 The best part is that the city of El Paso wants to build trails in their city parks. They have one park that is just primo for it. We’re going to do some flagging this Sunday. But tomorrow is all about making Mad Cow as fast going up as going down. If you live in El Paso and haven’t ridden Mad Cow…..well….you’ve been missing out. It still needs some love. I got some new toys and I’ll be giving lots of trail love tomorrow. I spent an evening fixing up the bob to hold the toys. I had to bust out the tiny wheeled circus bike since my bob doesn’t have the 29er friendly attachment. A few minutes with a jigsaw and a door knob drill bit, and I got this sucker dialed. It’s over 12 feet long all together. I picked up an Italian Grape Hoe that is super comfortable to swing. It will work well in softer conditions or for roots that need to be cut. I tested it out in the garden and it’s like a hot knife in room temp butter. I gave the handle a bit of protection with an old Nevegal. We’ll see how that works out. 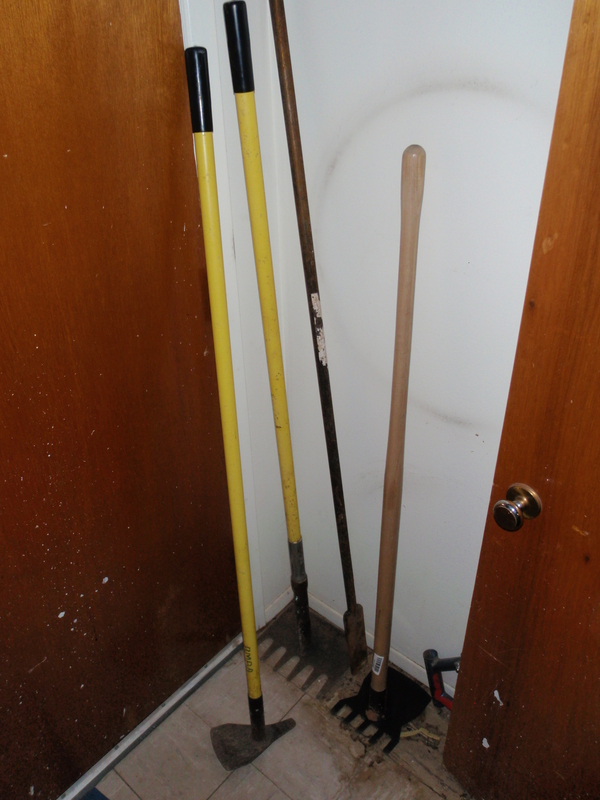 I also picked up an extra long Mattock. My other Mattock is super burly, but it’s heavier and has a super short handle. It works well in the steep terrain when working on bench cuts, but Mad Cow is kind of flat. Of course the trailer has room for the McLeod. I also fashioned a little water bottle holder for extra fuel by cutting up a water bottle and taping it to the trailer. The fuel bottle fits in nice and snug. In the bag I have long pants, face shield, hat, gloves, a file, and the chainsaw attachment for the Husque. I can’t wait to put the blade that’s mounted up now to the test. I’m not sure I’ll use the chainsaw blade. It’s for big stuff. Mad Cow has mostly little stuff that likes to grab your arms and feet. I’m just hoping my ghetto carpentry skills hold up and the back board doesn’t break. I took it on a test ride on the trail by the house. Everything seemed ok but I decided to put the padding in there to protect the Husque. So tomorrow will be about 45 minutes of road to the trails….another 30 or so to Mad Cow. I’ll spend an hour or two on Mad Cow, then ride some more. Then head back home. Hopefully it will hold up. Check back for photos of either disaster or pure trail love bliss. My blog has been getting plenty of hits this week. I’m guessing it’s because people are wanting to see what happened with the puzzler. It was a huge success for us. More than twice as many people than last year, longer, better weather, more food, better prizes, and a real bike race vibe. Thanks to everyone who volunteered. Races never happen without volunteers. Sometimes you get a good spot to watch some action. Other times you are stuck in the middle of nowhere and riders come by huffing and puffing every 5 minutes. So thanks a bunch to all of you who put up with broken up cell calls and complaints and confusion from riders. We are getting flurries today and it’s really cold. I’m so glad we had the weather we did for the Puzzler. Next week is Old Pueblo. It should be interesting. 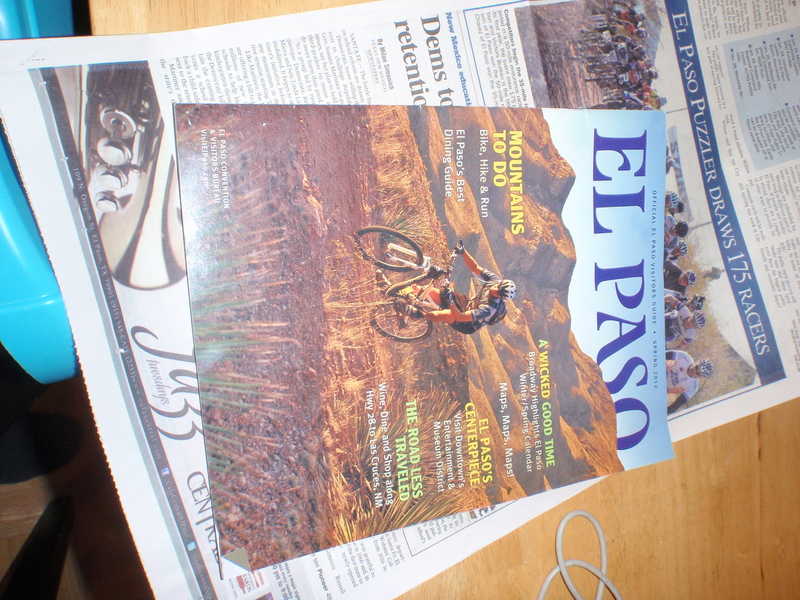 For those of you in El Paso, please check out the BMBA blog. We’ve got some work to do.